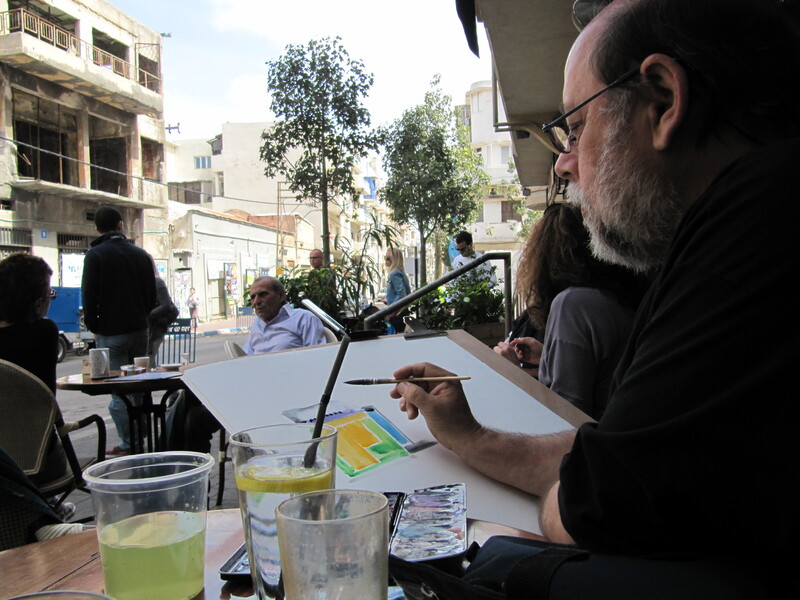 Posted byJosef Ralt	 August 15, 2015 August 16, 2015 Leave a comment on What can be learned from sketching in cafe. Apart from the sheer pleasure of doing it, here are some of my observations after doing it for quite few years. First and foremost, I would say that sketching generally and not only in cafe has a very beneficial influence on gathering confidence trough proficiency with a gradual enhancement of eye-hand coordination .This coordination is the very heart of being able to concentrate on the Whole Form before going into the specific details. The Whole is larger then the sum of it’s parts and preceding them in appearance. This basic gestalt principle is where many of the art teaching of the past with the emphasis on the realistic-academic drawing went wrong for very long time and it is still used unfortunately to this day by many followers of the academic training. There is nothing wrong of course in mastering the tools of a good craftsmanship but the usual approach of the academic teaching emphasising , right proportions and “correct” angles by following the obsolete system of linear perspective is everything but the reality of how human eye looks at the world. The great revolution of the 20th century in Art, with the advent of Cubistic perception of the World has finally released us from the confines of the Brunelleschi’s perspective and I believe the illuminating concepts of the great British painter David Hockney hold a great significance in the way he interprets the Cubist approach to looking at the world. In his memorable photo collages he shows how we actually look at the world from different points of view, scanning our visual field utilising much more then just one, two or three vanishing points. In this short video Hockney shows why the old traditional view of the Brunelleschi’s era is not only wrong but actually makes no sense in theological sense as well. 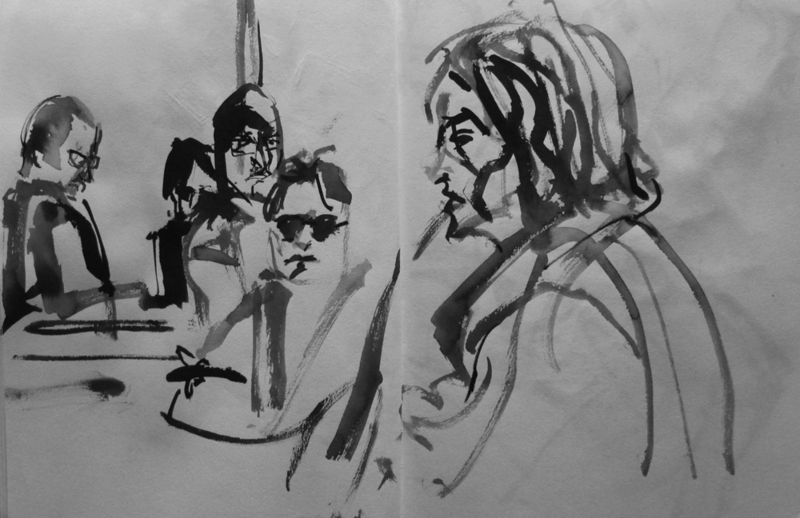 So another great benefit of sketching the ever changing moods and subtle movements of people in cafe is allowing to focus on the whole rather then the details. Many of the beginning students in my cafe sketching classes have great difficulties in giving up trying to construct the figures from the usual linear approach but once they are able to let go and the gesture is grasped, the Whole emerges with details fall in they right place. It doesn’t matter what is the choice of the medium. 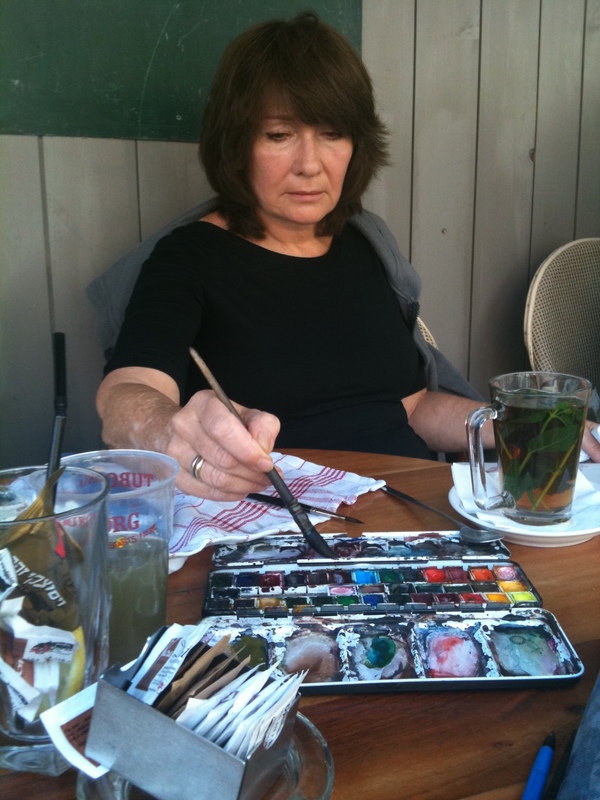 Be it watercolour, pencil, charcoal, crayons or any combination of all of the above. 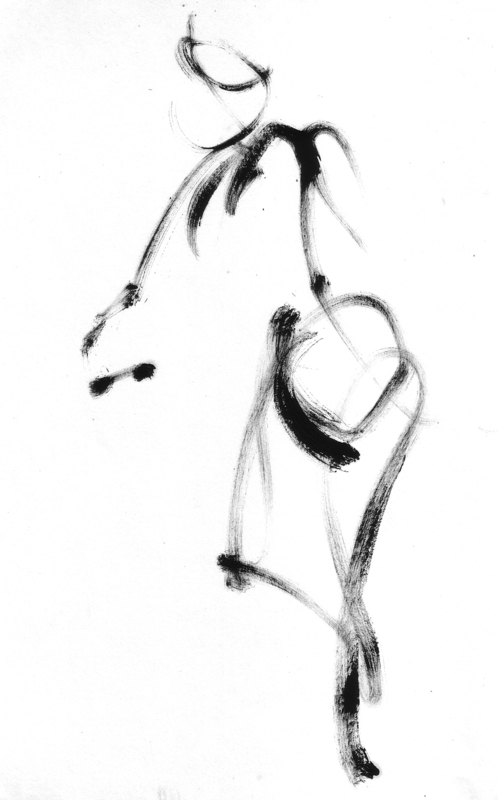 With any medium, the main thing is being able to concentrate on the theme, which can be anything from a way someone holds a cup of coffee in their hand, a face that has something telling about it, a general gesture or something more abstract like an animated conversation between two or more people. Many times there is a group of people interacting with each other and it can be a real challenge to find the central focal point that captures the individual movements and at the same time gives a sense of a whole. 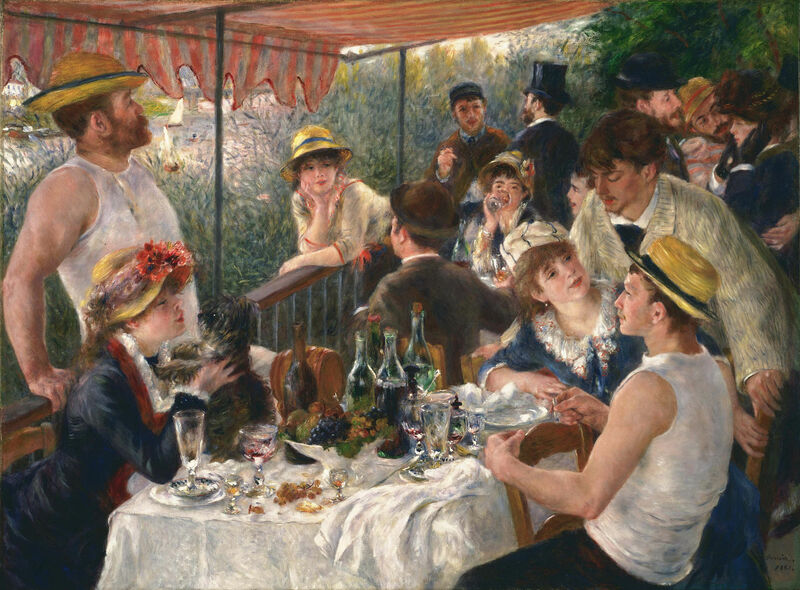 One of the well known paintings on this theme is the masterpiece Luncheon of the Boating Party by Pierre-August Renoir. I am using this great work of art as an example in spite of the fact that I personally do not like Renoir’s style of painting .This is perhaps the only painting by Renoir that is not totally boring in his usually excessive sweetness of colours. There are many articles and books written about this specific painting so I will not go into interpretation of the meaning but here we have a nice illustration of the theme of group of people in a casual interaction with each other in the context of a cafe held together by brilliant composition in which the table with it’s magnificent still life is the common ground from which the individual figures emerge and unified. There is usually not much talk about this issue of the Impressionists use of photographic images in their work but there is much evidence for it in much research on the subject. I haven’t found any evidence for my speculation about Renoir using photograph for this particular painting but I think it is not too much to assume that if most of the artists did use it then why would be Renoir the only exception. I personally do to think it matters much for the fact that it is a great painting and obviously neither Renoir’s not any other famous painters greatness is diminished by the fact of their use of then available photographic equipment. All I try to establish here is the fact that by using sketches and gestures we can get away from the limited one point perspective and thus get closer to breaking the barrier between the felt and the purely optical.